BioMInF is the only toothpaste that releases an optimum level of fluoride, calcium and phosphate onto the teeth surfaces to create a protective layer called fluorapatite (Armour for Teeth) for up to 12 hours after brushing. This Armour for Teeth is 10 times more resistant to acid attack (such as when drinking fruit juices and fizzy drinks) than the protection given by other leading toothpaste brands, so it protects for much longer! Pain from sensitive teeth can be caused by numerous conditions, but one of the main causes is the loss of the white enamel surface eroded over the years by sugar, or by the use of abrasive toothpastes and hard brushing. This exposes the tubules in the teeth (pores) that lead to nerve endings and affected by hot and cold food and drinks causing pain. 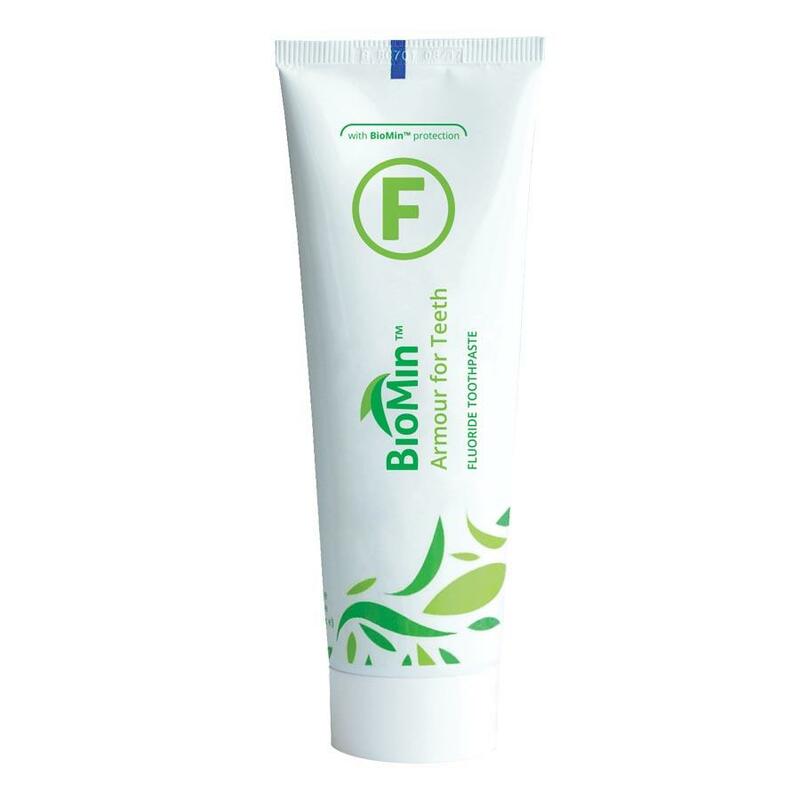 BioMInF is a smooth toothpaste and made of very fine particles to minimise wear and as they are smaller than the exposed tubules, they penetrate into the tubules to block them. Most patients report a rapid reduction in sensitivity and a greatly improved quality of life! Some dental treatments such as teeth whitening and scaling can also cause sensitivity pain, so BioMinF can be used before and after the treatments to help ease these effects. BioMinF uses advanced 'bioglass' technology to bond to the teeth surface and unlike all other toothpastes, the bioglass contains fluoride, calcium and phosphate. The bio-glass slowly dissolves over the next 12 hours releasing the minerals to guard against acid attack (sugar), the prime cause of tooth decay. BioMinF also increases its level of protection as required by dissolving faster as sugary foods and drinks are consumed - so it's a very smart toothpaste too! Other toothpastes use a soluble fluoride which rapidly dissolves and is therapeutically in-effective after just 1.5 hours. This then leaves the teeth exposed to acid attack until brushed again! Contains smaller, softer particles so is less gritty and abrasive on the enamel than other toothpastes. I don’t normally write reviews, but people need to know about Biomin! Since using it I’ve noticed that my teeth get far less stained after tea/coffee and realised it must be the “armour” provided by Biomin. Also, when I went to see my hygienist (who recommended it), he said that my plaque was good and realised that must be down to the “armour”, too. I have very weak teeth and now that I know what a difference Biomin makes, I’m definitely going to keep using it! I am housebound due to illness. My dentist visited me at home a year ago and said there was some mild decay in one tooth. I started using biomim toothpaste six months ago. My dentist visited me recently and says there is now no decay and my teeth are all fine. I didn’t think it was possible to reverse decay, however mild. I believe the improvement in my teeth are due to biomim toothpaste as it is the only thing I have changed in my oral care routine. I am very impressed with this toothpaste and highly recommend it. Have been using BioMin toothpaste since first reading about it over one year ago and am really pleased with it as are people I have given or recommended it to. My teeth feel cleaner and less sensitive and it is good to know that there is protection on your teeth even if you do eat sweet things. A mild, pleasant tasting, toothpaste which really appears to have improved the enamel coating on two teeth that have cracks. I’ve been using Biomin F since it was released and have been very impressed with it. I have some gum shrinkage at the back of one of my front teeth which was painful at times even with using Sensitive toothpaste. Since using Biomin this has completely disappeared and I’ve had no further problems. I wouldn’t use any other toothpaste now. Not only does this product do exactly what it says on the 'tin' it is actually a pleasant enough taste for my children to use regularly. Such clean teeth and no sensitivity! My teeth feel clean just like I went to the dentist, except now its every day. The taste is mild and gentle and easy for kids to get used to.